I have finished my first UFO of 2013,( a little happy dance called for here ), I started hand quilting this quilt at the end of last year, and took it up again this January. I have only done it at Wednesday Club and the Bee and have done a myriad of other quilting and knitting things in between. I am so pleased to have finished it, yea!! 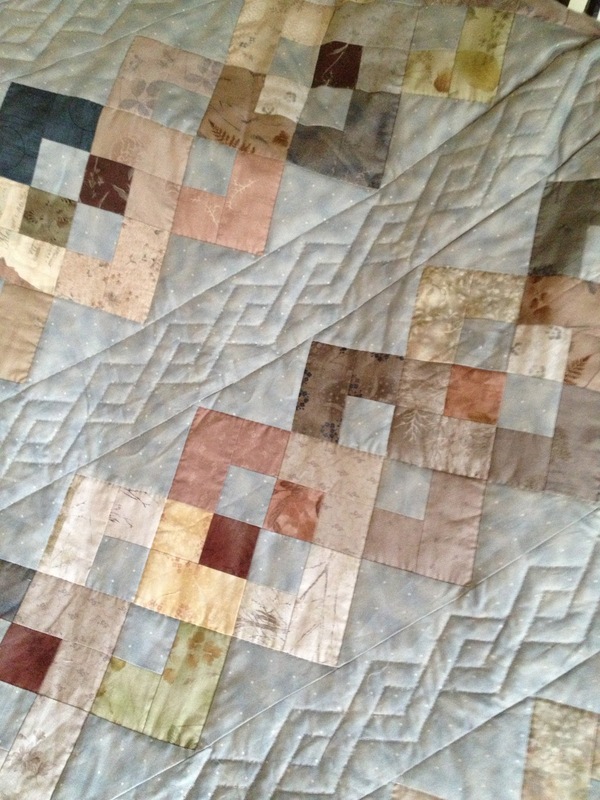 My friend Jenny calls this quilt "the epitome of sludge." Do I mind, NO, not at all. I love sludgy colours though I have read some quilters refer to them as low value quilts. The picture is not a true colour as it is more pale blue than grey. The second photo show the colour better. On a not such a happy theme, my lovely husband thought he was helping and put my woollens on to wash. This is my favourite cashmere sweater and some of my hand made socks.The socks now measure 5 1/2" and the cashmere sweater now has a 34" bust. I have not been a 34" bust since I got married, and as you know we celebrated 50 years of married life last September. He has since bought me 3 new cashmere sweaters, so all is forgiven. Well it will be when he replaces the lovely pale blue one, that was my favourite. I know it is the middle of winter, but no one seems to stock that lovely periwinkle blue at the moment. Now to sort out my next UFO, the hoody cardigan is almost finished. I just have the ends to sew in and the cord bind off to do. Love the 'Low Volume' quilt.. Very on trend. Oh! Tereasa I would love to have a look at you book, could you leave it at QH for me perhaps. I will make sure you get it back. 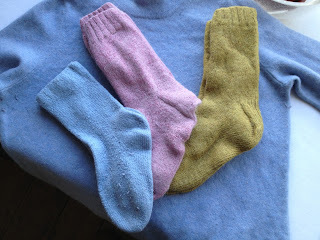 I did think about making a cushion from the blue jumper, I have two others as well. Thanks for the offer... Doti..